Araneus diadematus, more commonly known as the Garden Spider, or Garden Cross Spider, measures between 4 - 8mm in the male, the female being much bigger at 10 - 15mm. 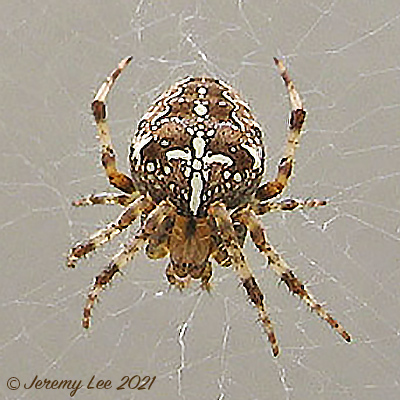 Both sexes of Araneus diadematus have a clear white cross of irregular-sized dots on the abdomen. Ground colour ranges from bright orange to black, but is usually some shade of brown. Spins a more or less vertical orb-web, usually well off the ground on bushes or fences, or between the branches of trees, and catches a wide range of flying insects. The spider usually hides close to the web, but sometimes sits motionless in the middle. Adult late summer and autumn, when the webs are most obvious. Overwinters in the egg stage, the eggs being enclosed in silken bags fixed in bark crevices or under window sills. Swarms of tiny yellow and brown spiderlings emerge from the bags in spring. Can be found in almost any well-vegetated habitat; very abundant in hedgerows and gardens. Very common throughout the UK.